Only one photo tagged with Cobham (A2). If you have one, why not upload it? This is the Esso garage on the A2. For large services on the M25, see Cobham services. Now a large petrol station at the side of the A2. The field boundary around Henhurst Dale happened to be the perfect shape for purchasing and turning into the westbound services many decades later. 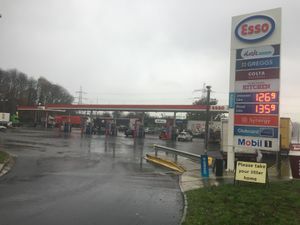 The first sign of the current service station came in 1959, when a petrol station and transport cafe were proposed in the exact position of the current westbound service area. This would have been aiming to replace mobile vans and other businesses which were going to lose trade as the A2 gets improved. In 1968 the A2 through here was widened, and a service station opened on each side of the road. Both sides had a petrol station and a Little Chef positioned close to it. In 1995 there were plans to demolish the eastbound Little Chef and replace it with a Travelodge. This didn't happen, but the restaurant and the adjacent forecourt were eventually closed and demolished in 2007. Despite the road being widened again in 2009, access to the rubble was preserved in case it was needed at a future date. The westbound restaurant closed in 2007 too. The filling station was rebuilt in around 2011, taking over the abandoned building to make way for a much larger forecourt. In June 2015 it was sold to MRH, who removed the Costa café but maintained the On The Run branding until 2017. In Autumn 2017, an extensive refurbishment was made to the shop and it was changed to a Hursts Grab & Go with a Greggs concession and Stone Willy's Kitchen.